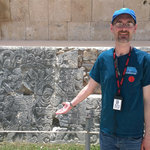 David showing off some of the carvings in the walls of the ball court. 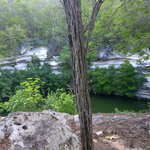 About a ten minute's walk from the main site was an underground river. 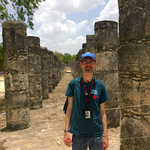 David inside the Thousand Pillars. 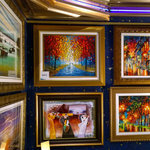 The art gallery on the ship had a bunch of paintings most of which were offered up at the various auctions. We really liked the top center one, and also the "intense impressionism" paintings on the right by Daniel Wall. 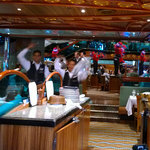 At dinner, our waiters danced for us. It was a little weird. 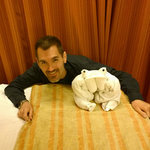 David with the day's towel animal, a frog! 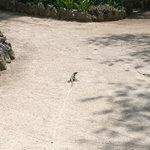 At Chakanaab Park, we saw these two big lizards moseying around. 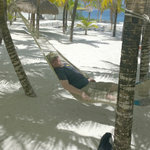 We relaxing in these hammocks and read for a bit. 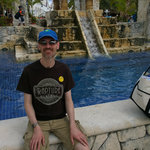 Even in the shade, it was pretty hot! 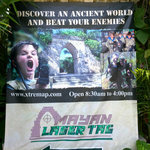 I didn't know the Mayans invented Laser Tag! 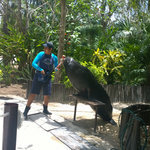 The trainer brought a sea lion out for us to see! 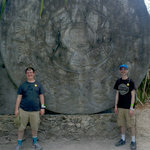 Us with a replica ruin from the Mexica. 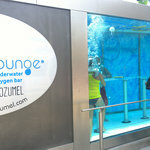 This "underwater oxygen bar" in Cozumel was a real thing! 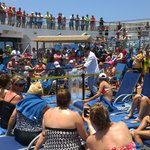 The people inside were attempting to play Jenga. 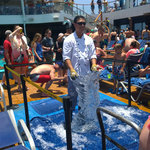 The towel animals got harder and harder to imitate. 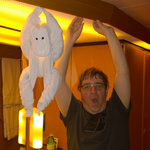 I was impressed they managed to hang a monkey from the light! ...and here's the finished product! Honestly, I'm not 100% sure what this is, but it does look very intricate.